There are times when I hear about a product and see potential applicability for vandwellers and campers. This was one such time. When I heard about this product on a radio program this morning, my mind jumped back to trout fishing in the rain… I was cold, soaked, and wishing for something warm to eat or drink. This product would have fit the bill! 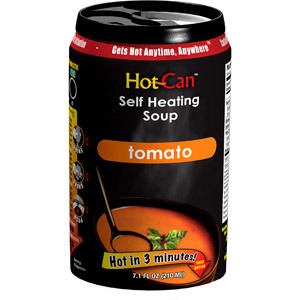 Tonight I bought two cans of “Hot Can” brand soup – one tomato (as pictured) and one of asparagus flavor. It is simple to heat the soup. 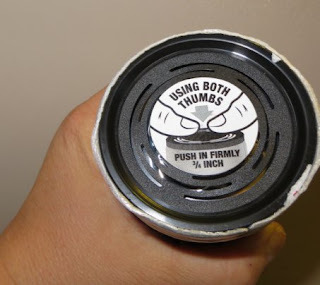 You turn the can over and using two thumbs, put a lot of force on the bottom. 3/4 inch of displacement is required. Suddenly there is a loud snapping sound (enough to startle you) and then the chemical reaction begins. While the soup is warming, you lightly shake the can. I noticed it did take a LOT of force to activate the heating reaction. Some dainty ladies or elderly people with arthritic hands might find it difficult to push firmly enough. Being a lover of all things asparagus, I eagerly activated that can first, assuming one container would fill me up. The directions said it takes about three minutes to heat the soup. I found it to be more like five minutes. The can warmed to a lovely temperature, the outside heating the hands like a cup of medium hot coffee. I popped the container open and tasted the soup. Much to my delight, the asparagus concoction was delicious! As I drove down the street, I slowly sipped the hot soup, once again daydreaming about fishing. And then the soup was gone. Empty. But the can was still very heavy! When I got home, I peered deep into the can and to my dismay, a great portion of the approximately 16 ounce sized container was taken up by the heating apparatus. Bummer! A glance at the side of the can showed that there was only 7.1 fluid ounces contained inside. Due to the heavy mass of the soup container, I simply assumed there was a lot more of the delicious beverage inside. Not so! 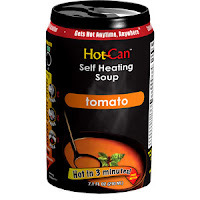 Still wishing for more soup, I activated the second can – this time the tomato flavored one. Unlike the first can, this second one suddenly emitted hot steam and I nearly burned my hand! I dropped the can which did not harm anything. It was activated but not opened, thankfully. Once it had finished heating, I opened the soup beverage and found the tomato flavor pleasing. But like the last time, the small quantity was a letdown. After drinking both soups, I was satisfied. The flavor of each product better than expected. But due to the relatively small serving and $2.99 price tag for each can, I was disappointed and probably won’t buy this product again soon. It’s too expensive, in my opinion. Also, since the can states not to use it outside the range of 50 – 90 degrees Fahrenheit, it might not work for ice fishing. If you’re going out in the cold, keep it close to your body. So the experience was mixed… I give it a thumb’s up for the taste of the soups and the temperature. One thumb’s down for the price and serving size. 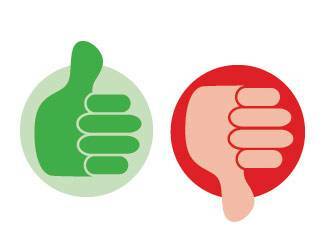 If a person does not mind the price, the flavors are quite good. One other thought – you can order this soup by the case at Walmart.com for a terrific price break. That way it’s about $1.60 a can – much more attractive! That’s about it for now. Thanks for stopping by today. One more bio hazard. Does Walmart take the can back like used motor oil? I think you should build a rocket stove. YouTube it, there cool. Interesting review, Brad. A few years back I tried one of the self-heating coffee drinks just for the novelty of it. Hmm.interesting find brother.I agree the price is a little steep considering although more unhealthy you can get full from a dollar menu. I am wondering, what kind of chemical reaction goes on in the can to heat up the soup. Btw, how hot does it become? I don’t know what kind of reaction they use… Presumably something like what is used in the hand and foot warmers I use when ice fishing. The temp of the soup is about 150-160 degrees when hot. It is nice and hot. I might have to pick up a couple of cans before the upcoming camping trip…. or just fill a thermos.